You may have noticed in my earlier blog posts mention of my excitement at the prospect of having a 3D printer in the library this year. I planned for it by attending workshops at U-Learn, tinkering around online with various 3D design web apps and carefully considering how I could implement it into the library programme. And despite all this research and planning the reality of the 3D printer in the library has both pros and cons. Over the last 4 months since our Ultimaker 2 arrived, shiny and begging for me to print something under the bright white LEDs; I have learnt the power of resilience, a growth mindset, engaging students in a new medium and the frustrations of 3D Printing. It’s totally mesmerising and hooks anyone watching it. It even makes it’s own music with a combination of whirs, zoops and squeaks that come together like a symphony of 3 dimensional magic. it’s hooked in some of our reluctant readers – who doesn’t want to make their very own 3D model of a 1970s classic mustang or R2-D2 cookie cutter? We found a lot of pre-made creative commons designs on Thingiverse as a starter. Did I mention you have to develop a high level of resilience when it comes to trouble shooting? 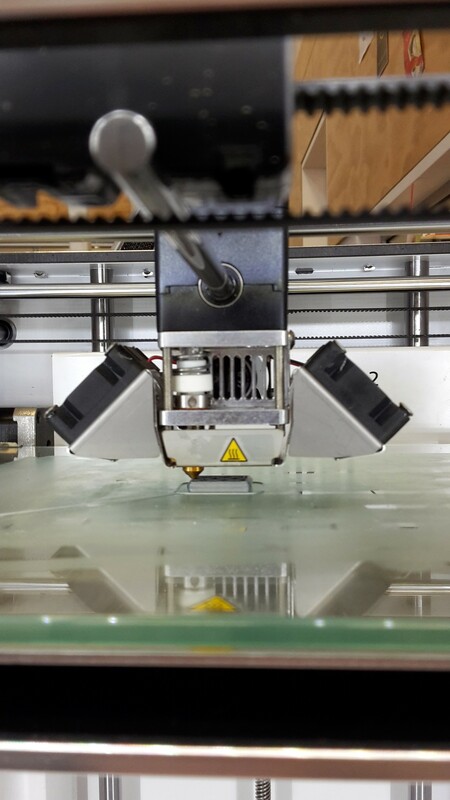 LIke all good (scratch that) printers that despite the rapid expansion of the digital age continue to be the most annoying and hard to use things on the planet; 3D printers take this to a whole new level. Not only do your designs sometimes print funny. You have to be careful to ensure that there are support structures in place for objects that do not all print on the same level/plane, or for phone cases where you have decided to print them sides instead of back down. Believe me, that was a disaster of stringy filament. Filament changing – anytime you want to print in a new colour, you have to remove the current filament, feed in the new filament and every second time watch as the printer feeder decides to munch your filament instead of melting it through the nozzle. The nozzle gets blocked A LOT! I have had to clean it every 3 prints, not only that but if you put the wrong or even right filament in it can have disastrous effects, otherwise known as the bird nest of filament effect. Without even venturing into designing, some basic level skills are required e.g. changing filament, print head speed, ensuring the nozzle is unblocked and not too much glue on the glass plate (otherwise you can’t get the design off). You need to learn these to even get started using a 3D printer at a concrete level. Whilst I have been frustrated, annoyed and at times totally fed up with the limitations of the 3D print craze, I am also enjoying watching our students bringing their 3D objects to life. The sense of success and level of interest that the students display in the printer has opened up conversations and relationships. These would never have occurred through normal avenues such as book promotion, movie clubs, board game evenings and reading mileage challenges. So for that reason an investment in a 3D printer has been one of the best the library has made. Would I purchase the same model again? Well for those considering a 3D printer for their school, start with a cheapish one. Warehouse Stationary and Office Max sell entry-level machines for between $550 – 1000. These are great when you are getting your head around what it means to 3D print and exploring innovating your maths, science, technology (basically any subject area) program with this technology. 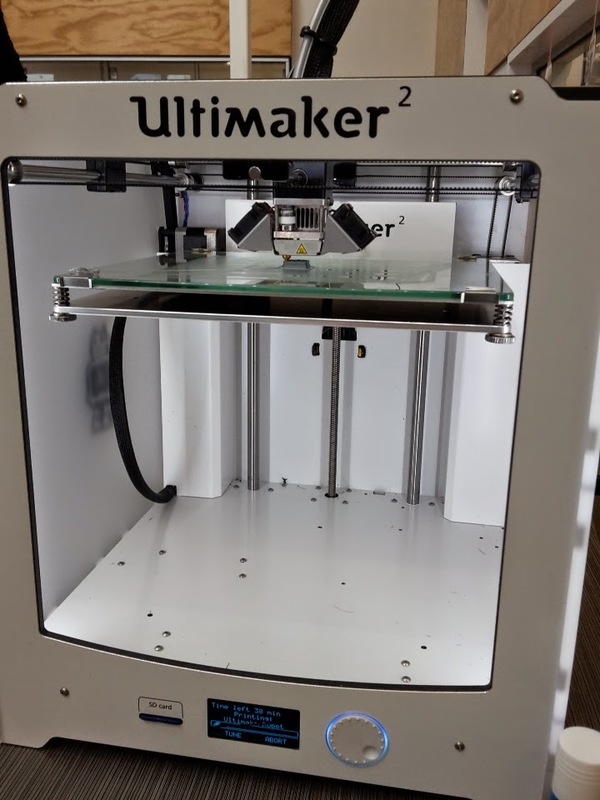 It also won’t break the bank as much as our Ultimaker 2 ($3200). Is it a fad or here to stay? Hard to say, but with the innovative use of these printers in fields such as medicine and engineering it would be worth exposing our students to them early. ← How’s your reading culture?